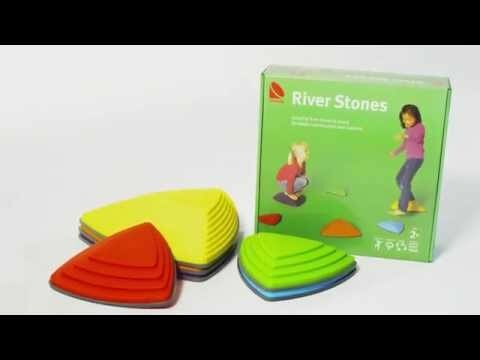 The Gonge river stones set is great fun for kids: they have to accuately judge the distance when hopping from stone to stone. Balancing on them requires a good sense of balance. Particularly stable and long-lasting. Can hold up to 100 kg. The Gonge river stones set consists of 5 hill tops and 6 river stones. These brightly coloured stones are highly engaging and can be used to quickly form a balancing path. Rubber feet underneath make it anti-slip. Changing between balancing when stationary and balancing when moving trains your ability to switch between moving and stopping. Improves your hopping skills, spatial awareness, coordination and perception. The Gonge river stones bring colour and variety to children's sport in nurseries, schools and sports clubs. The brightly coloured balancing stones are excellent for obstacle courses and activity landscapes. The river stones are highly robust, meaning they can also be used by average-sized teenagers, adults and older people. Also perfect for use in therapy and rehabilitation or fall prevention for older people. Get your Gonge river stones set from Sport-Thieme now. Great!! My children aged 4,6 and 8 all love these. Great for indoors or out in the garden. Easy to stack away and nice bright colours. A bit expensive for what they are but I think they will get played with a lot so worth the money in the long run. Gonge River Stones Set I have been wanting some of these river stones for some time for my children, but the price held me back. I ideally wanted 2 sets, the river stones & the hilltops, to give my children more options to enhance their play with both imagination & obstacle course style challenges. When I saw the fantastic price from this company for both sets in one deal, I could not resist & I'm so glad I purchased them. The transaction was smooth & delivery prompt. The stones themselves are excellent quality. A well designed, durable & sturdy set of toys that will clearly last for years. They easily take the weight of myself & partner, so adults can join in the fun too. I love how such a simple idea has so many benefits, gross motor skills, balance & core strength, co-ordination, imagination etc. With bright, attractive colours & endless options for play, they'll no doubt entertain our family for many years to come. Gonge River Stones and Hill Tops Just what we were looking for to aid our 2 year old daughter’s love of climbing, obstacles and balancing. Quality products. Bought as a duo pack which we would highly recommend doing, if you’ve got the space! Produkte wurden noch nicht ausprobiert. Die Kinder lieben dieses Set! Sie bauen die Steine sehr unterschiedlich in Bewegungslandschaften ein, verwenden sie für Rollenspiele oder üben sich einfach im Balancieren. Sowohl die Kindergartenkinder bis Kinder aus der 6. Klasse sind sehr begeistert. Fluss-Steine-Set Meine Turnkinder sind absolut begeistert. Egal ob ich es im Kreis aufstelle oder in einer Reihe, 5-6 Kinder sind immer am besteigen der Steine. Wir haben sie mittlerweile "Hüglis" getauft, da die Kinder immer Berg steigen. Auf jeden Fall keine Anschaffung, die man bereuen müsste. Über den Preis könnte man diskutieren. Plezier à volonté! Mijn dochtertje is superblij met de rivierstenen en bergtoppen! We bouwen parcours binnen en buiten. We betrekken de zetels en tafels erbij. Ze helpt creatief meezoeken naar mogelijkheden!